The Crumpet: Christmas Challenge Day 23 - Santa !!!!!!!!! Yay it’s the best day of the Challenge!! Santa !!! Even the owrd makes me feel happy!!! These nails didn’t turn out quite as good as I hoped, mainly cos I bungled his tunic, but I am still pretty happy with them. 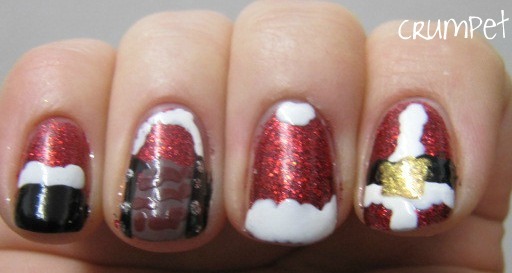 I did all of these on a base of Sally Hansen Downtown Rubies. 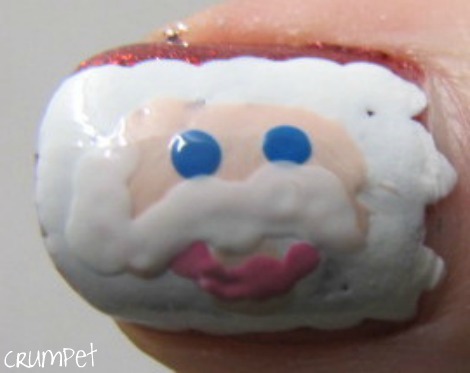 We have face on the thumb, then tunic, then hat, and boot on the pinkie. 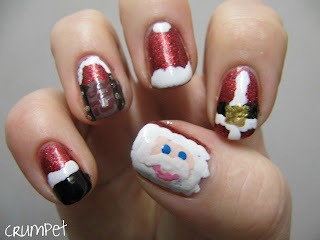 No one managed to guess what I tried to do on the ring finger, not even Boo. 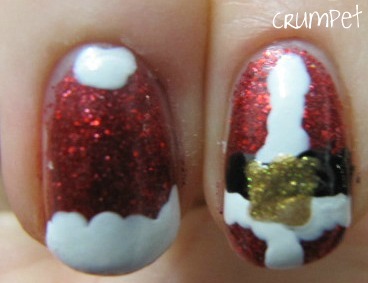 It’s supposed to be Santa’s fat bum sticking out the chimney, but I think the chimney is missing some key definition! There’s been some cool Santas manis this year – nothing gets more festive than Santa. We’ve peaked, I tell you, we’ve peaked!